Traditionally believe that the taste and quality of food depends on its spices and sauces, the essential ingredients to making a delicious meal. Therefore, soybean paste, soy sauce, red pepper paste and kimchi are some of the healthiest and the most important staple in a Korean household. Korean food is never the same without red, hot peppers. Hot peppers are the main ingredient of gochujang (“red pepper paste”) and the required ingredient in several casseroles and side dishes. The components in peppers, whice gives them their spicy taste, helps to relieve pain and breaks down fat, making red, hot pepper an ideal dietary food. This soybean paste has been popular among Koreans for over 2,000 years. The ingredients consist of soybeans, salt and water, which are combined with natural elements, such as sun and wind. Doenjang has been scientifically proven to help prevent cancer. People from all over the world come to Korea to enjoy this soybean paste. It is used in casseroles or mixed with fresh mountain herbs. Gochu-jang (“red chili paste”) is made from dried peppers, salt, water, fermented soybeans and sweet rice powder. These ingredients are mixed thoroughly and then femented, which enhances the spicy flavor of this sauce.People typically eat rice mixed with this spicy paste and sesame oil. They also use it as a dipping sauce for fresh vegetables. Ganjang (“soy sauce”) is made through the same process as soybean paste. Water and salt are added to soybeans and then fermented for two months. During the fermentation process, amino acids and lactic acids are released, which creates soy sauce. Ganjang is used in casseroles and soups. It can also be used as a dipping sauce for various fried foods. 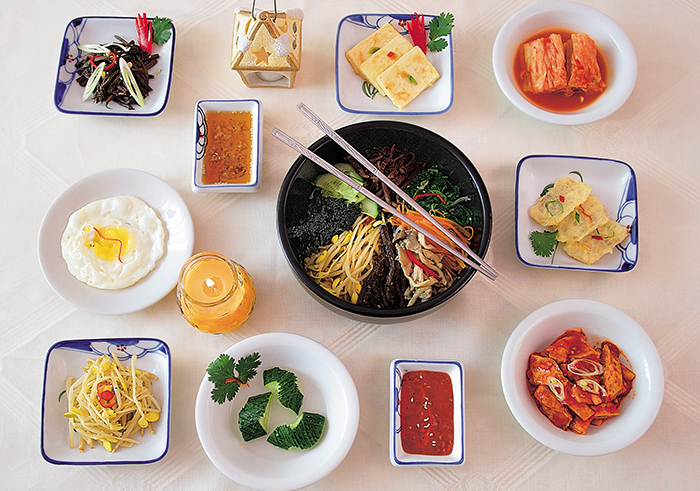 Korean sauces, which include soy sauce, soybean paste and red pepper paste, are enjoyed with fresh spices and condiments. Onions, garlic, scallions, ginger, sesame oil, crushed sesame salt and powdered red pepper are among the most popular spices in Korea.